Then they quit in less than a year and the time, effort and money you spent licensing and training them walks out the door. Most agencies address foster parent turnover primarily by frantically trying to recruit more foster parents. Reseach proves that's the wrong approach. Instead, it's much more effective to address the reasons your foster parents quit in the first place. Why are foster parents quitting? fix poor communication: Our secure, online collaboration software improves communication between all members of a foster care team. Our modules for journaling, child behavior tracking, discussion forums, file management, and much more improve the quantity, quality and context of every discussion your foster care teams have. Collaboration software has been proven to increase transparency and lead to faster, more effective and accurate problem-solving. address struggles with stress and dealing with grief and loss: Journaling is the primary tool recommended by therapists for clients who are struggling with stress, grief, and loss. It’s also a key tool to help caseworkers and counselors assess the challenges and stressors in the foster home. Our journaling module is so easy to use, your foster parents will dictate journal entries using their phone in seconds. boost training: A training module that facilitates easy dissemination of resources, videos and other training materials to all your agency’s foster parents, so they can access them as they have time and re-access them as needed, is cost saving, effective and efficient. improve agency support: Data-driven alerts help focus attention where it’s needed most and shortens the window of time between issue identification and issue resolution. Also, the agency dashboard provides insights into all of your agency's foster homes, foster parents and foster children, highlighting which ones are in the greatest need for support and intervention. Not compared to the cost of the foster parents who are quitting your agency every year. And the cost that is hardest to quantify is the cost to your foster children, as they have to be placed in yet another foster home. Imagine if you were able to break this cycle. Imagine if you were able to reduce your foster parent turnover, and increase support for your foster parents and foster children at the same time. Imagine how much better your agency would run using a platform that utilizes communication and collaboration to tackle foster parent turnover and address all of the primary turnover drivers. To answer your question directly, the cost is $600 per caseworker license per year. All others users are free. If a single foster family is retained anytime within the next decade, the caseworker’s license cost has been covered. Any additional retentions over the next decade are positive returns for your agency and foster children. FosterCare.Team can be a GAME CHANGER for your agency. Research has repeatedly proven one indisputable fact: The most effective asset for recruiting new foster parents is existing foster parents. We can show you that the most effective asset for supporting and retaining existing foster parents is FosterCare.Team. We're glad you asked. Caseworkers often quit because they feel overwhelmed. They feel like all they do is put out fires and manage paperwork when what they really want to do is social work. Our platform simplifies communication while it organizes tasks and documents, allowing caseworkers to focus what they love: social work. What’s that worth? The National Child Welfare Workforce Institute shows the cost of replacing a caseworker when totaling the overtime paid while a position is open and expenses for recruiting, hiring and training a new caseworker is at $54,000. If your agency can retain just a single caseworker, that act of retention covers the cost of a caseworker license for 90 years. Here's another way to look at it...if you can retain a single caseworker, the cost savings cover your licensing costs for the next five years…for eighteen caseworkers! We think that's a pretty good ROI. Ready to get your agency on board? 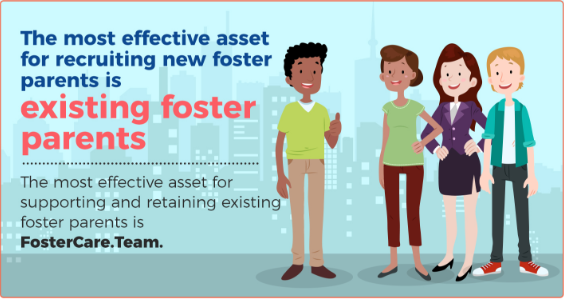 Become part of the FosterCare.Team collaboration platform, give your agency all of these advantages and learn why multiple states are exploring ways to implement FosterCare.Team across all of their foster care agencies. You'll find our pricing is simple and flexible. Sign me up! I like that ROI! Chat with us using the icon in the bottom right corner of your screen. (If it's visible, we're online ready to chat.) Or, learn even more about what we can do for agencies and foster parents. You can also view FosterCare.Team in action from our tutorials page.